Product information for optical people. 8031S Stainless MicroTool T his simple to use tool set allows you to extend the spring hinge barrel to hold it in the open position. The self-locking plier makes it easy to align the temple with the frame front and insert the hinge screw. Single handedly assemble those frustrating spring hinge frames in seconds. that your fingers will ever love. Grip Driver NOW Twice as versatile – new enhanced design! SPRING HINGE P L I E R K I T 8032S Stainless MicroTool Nose Pad Popping Plier Quick, easy and secure to remove push-in nose pads without changing position of pad or arm. 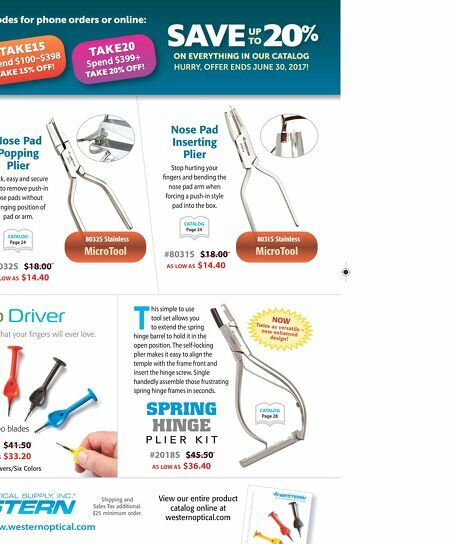 #8032S $18.00 LOW AS $14.40 CATALOG Page 28 CATALOG Page 24 combo blades $41.50 AS $33.20 Drivers/Six Colors #2018S $45.50 AS LOW AS $36.40 Nose Pad Inserting Plier Stop hurting your fingers and bending the nose pad arm when forcing a push-in style pad into the box. 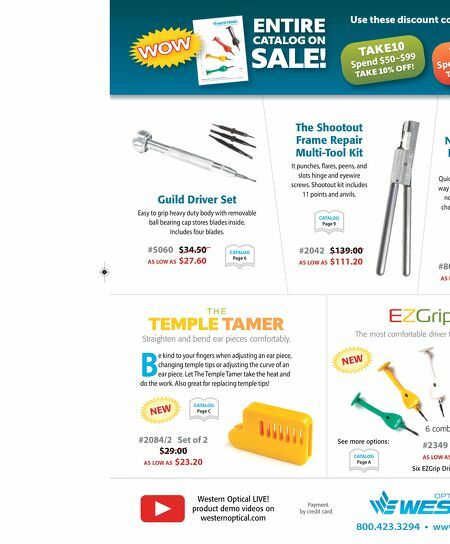 #8031S $18.00 AS LOW AS $14.40 CATALOG Page 24 Shipping and Sales Tax additional. $25 minimum order. ww.westernoptical.com View our entire product catalog online at westernoptical.com SAVE 20 % UP TO ON EVERYTHING IN OUR CATALOG HURRY, OFFER ENDS JUNE 30, 2017! codes for phone orders or online: TAKE15 Spend $100–$398 TAKE 15% OFF! TAKE20 Spend $399+ TAKE 20% OFF!